A beautiful fireplace console with traditional beauty and contemporary utility for the living room, bedroom, or anywhere you wish to display a TV and cozy up to warmth. Raised panel doors with safety-tempered glass, contoured edges, and finely detailed moldings highlight this TV stand from the Crossmill collection. 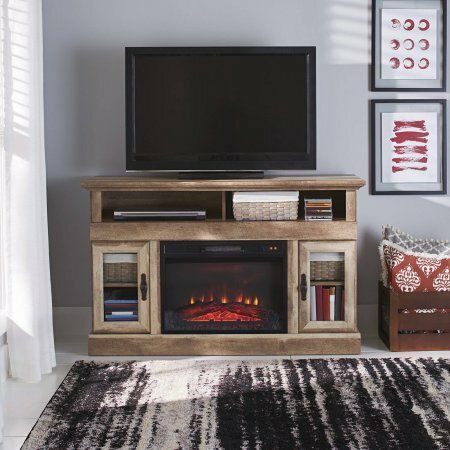 Finished in a Weathered oak finish, the electric firebox includes remote control and heats up to 400 square feet. The console holds up to a 60-inch TV plus satellite or cable box, DVD player and other electronics. With such handsomely crafted old-world aesthetics and modern-day functionality, isn't it time you brought home this media console with built-in fireplace?